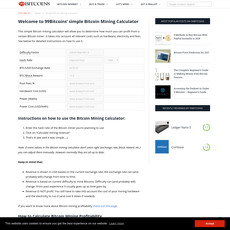 There really is no secret here, What To Mine’s tool is comprised of calculators that tell you what to mine. In cryptocurrency mining, the profitability of a specific coin fluctuates often. Of course, if you spend thousands on advanced computing rigs and electricity to mine cryptocurrencies you will likely wish to mine the most profitable coins. Using What To Mine will help aid you in your never ending battle by calculating the costs of your hash power and electricity and comparing them to the value of the plethora of minable currencies. 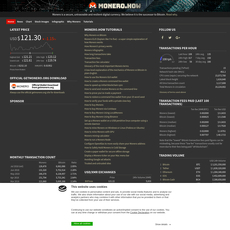 - Several exchanges are available to find the exact price of the coin you are mining and where you will be selling it. 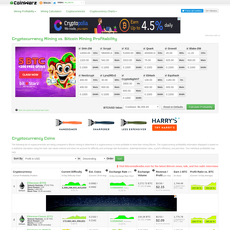 These exchanges include Binance, Bitfinex, Bittrex, CryptoBridge, Cryptopia, HitBTC, Poloniex, and YoBit. 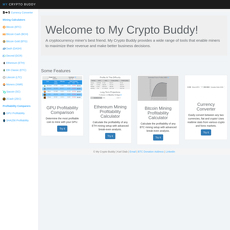 - Includes calculators for both GPU mining and ASIC rigs. - Various time intervals allowing you to see the profitability of a coin over a previous specific time. 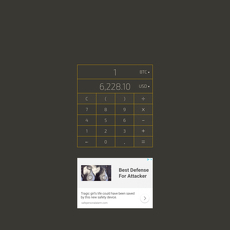 The most intuitive and conclusive mining calculator I have ever found. Very easy to use. 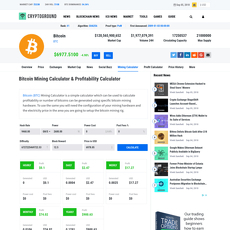 The calculator is right on the homepage and allows you to view profitability for specific criteria over hundreds of coins. There really aren’t any cons that come to mind. This tool is pretty straight forward and does well in providing its purpose.